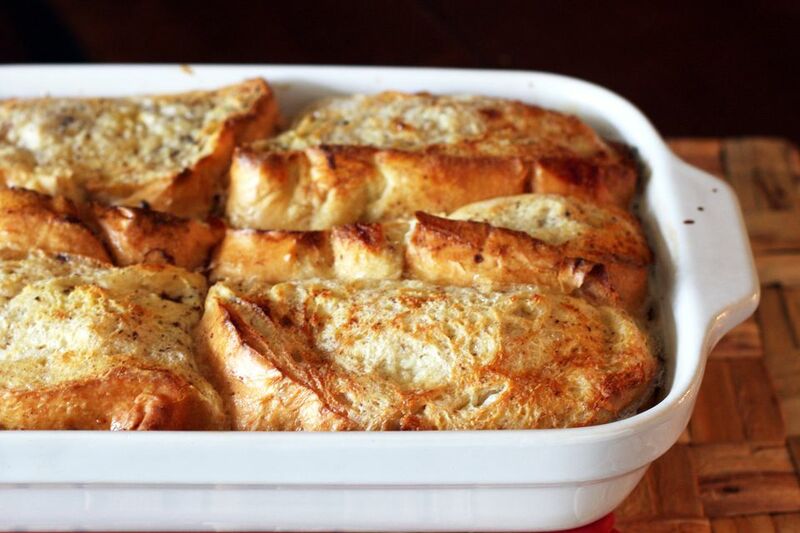 This overnight French toast makes a perfect breakfast for family and guests. This French toast casserole is especially convenient since it can be prepared the night before and then baked in the morning. You might also like New Orleans Style French Toast or pain perdu. Spread butter over bottom of large baking pan jelly roll pan with 1-inch-high sides. Arrange bread slices in the pan. Combine eggs, milk, sugar, syrup, vanilla, and salt in large bowl; whisk until well blended. Pour egg mixture over bread. Turn bread slices to coat evenly. Cover with plastic wrap and refrigerate for a few hours or overnight. Preheat oven to 400 F. Bake for 10 minutes. Turn the bread over and continue baking just until a rich golden brown, about 5 to 6 minutes longer. Transfer cooked French toast to plates and sprinkle with confectioners' sugar if desired. Serve hot with maple syrup or your favorite topping.